Earlier this week, Tourism Authority of Thailand (HK) released a new promotional video that has quickly gone viral. The video posted to the Hong Kong Facebook page of TAT on Monday has almost reached 1,000,000 views already. Amazing Luxury Thailand: Where Life Rules Everything shows a different aspect of a dream travel experience in Thailand. There were mixed responses about this latest clip both from local people and foreigners. 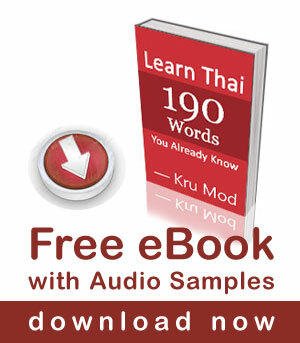 I have been working in and visiting Thailand for over 50 years. I do not see the country or its people as a resource to be exploited or abused by hedonistic visitors. Today, too few farang understand that Thai culture is one of quiet respect and not one that welcomes drunken loud, badly behaved visitors. Showing off, displaying excess and treating the country and its people without respect are typical of uneducated, Westerners with more money than brains. Arrive quietly, behave with manners and respect and you will be welcomed by Thai people at all levels. Hi Mod! I LOVE your site! As a long time Thai resident, an artist, and a filmmaker, I think they did an excellent job of creating the atmosphere required to entice young people with new money to come here. This isn’t aimed at the top 1 percent, but people who make an above average income who can splurge for that one trip a year (or a lifetime). Just because some people have money to spend doesn’t mean they are especially privileged. If there are no people with money to enjoy the arts and crafts of Thailand, and other countries, then there would be no fine art, no enticing architecture, and no fine food, anywhere. 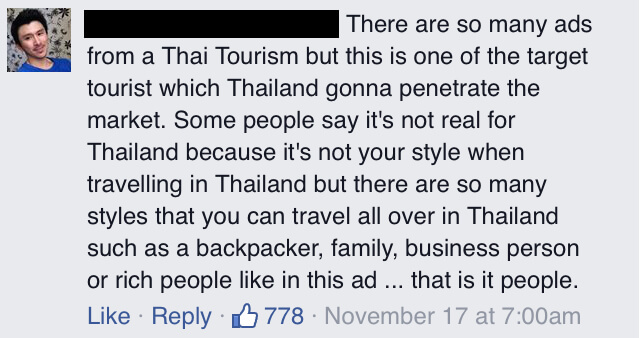 I’ve experienced Thailand and other countries as a backpacker and luxury tourist, and enjoyed both ways.